Democrats were obliged to expand their base after the 1972 McGovern campaign. The Republican Party now finds itself in the same boat. Who knew? It turns out that Fox Television and hard-right radio, long the bêtes noires of liberals, are more harmful to conservatives. Media personalities have sucked the air out of what was once the big tent of the Republican Party. Stoking divisions, anxieties, and grievances is good for ratings and advertising revenue, but over time, these tactics shrink-wrap a national political party. Republican office-holders and -seekers have found it necessary, so far, to pay obeisance to this daily drip of poisonous injunctions and warnings. The result has been small-tent policies toward African-Americans, Hispanics, women, gays, lesbians, the environment, immigration law, and other constituencies and causes. In this case, small-tent policies were insufficient, even with official unemployment nearing eight per cent, to elect a well-financed businessman who might have been summoned directly from central casting. McGovern lost by a landslide, while the popular margin of President Obama’s victory over Governor Romney was narrow. The portents are the same, however. Blaming this election result on the weather or the candidate will prolong small-tent politics. 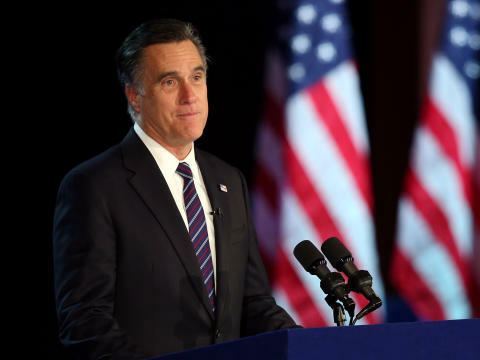 True, Governor Romney was a deeply flawed candidate, but he faithfully trimmed his sails to the dictates of intra-party politics. The policies that resulted were so small-tent that they could not be rescued by voter suppression laws or super-PAC donations. The Republican Party’s approach to arms control has also come to reflect small-tent politics. Treaty ratification is an ideal playing field for the hard right, because Senate procedures and Constitutional requirements empower minority views. Republican Senate leaders and Presidents were once instrumental in ending nuclear tests, controlling the superpower nuclear competition, and shifting the arms race into reverse gear. Now, careful listeners will be hard-pressed to find a deep, strong voice among the ranks of Republican Senators ready to ratify a treaty ending nuclear testing, thereby confirming a sixteen-year-old practice. Will part of the Republican rethink of small-tent policies extend to the Comprehensive Test Ban Treaty in a second Obama term? The administration has its work cut out, going door to door on Capitol Hill. It has strong reasons for the Senate’s consent and effective rebuttals to the arguments of bitter-enders. Elders must come to the rescue of this treaty, along with grass-roots campaigns. Statements from Beijing, New Delhi, and Islamabad that they intend to pursue ratifications in the event of the Senate’s consent could figure prominently in the Senate’s deliberations — if they can be elicited. President Obama has stated repeatedly that he will try to tackle serious issues and campaign promises not addressed in his first term. The CTBT certainly qualifies. If, at the end of day, sufficient Republican votes are not forthcoming, Democrats can hold off on an up-or-down vote, U.S. national standing will decline as nuclear dangers grow, and the Republican Party will again huddle under its small tent. Blocking a popular, verifiable treaty that ends nuclear testing is one way for Republicans in and out of the Senate to reaffirm their minority status. After the 1968 McGovern campaign (he did run after RFK was killed but did not get the nomination) Nixon beat Humphrey and Wallace. The McGovern landslide loss was in 1972. I don’t think the problem is partisan politics. Big tent or small tent. The problem is the United States has no notion of the notion of strategic in any of the political parties. We Americans have no link between the balance of forces as they are, where we want them to be, and how the American military is to be shaped and used in order to bring the desired balance into being. Both parties, and most Americans have degraded into the mindset that the gap between the United Sates over the full spectrum of military force should be as wide a gap as can be had at the immediate moment. Resulting in our open loop spending on weapons systems made to function in a battle of the Atlantic and the Intergerman border that never happened. Arms control calls for a balance of forces that is agreed upon by all parties participating. Until the United States government can synthesize a rational strategic stance that is rooted in reality the cause of arms control will continue to be lost voice in the wilderness. —I think you should note one thing: the right-wing does not want to think of nuclear weapons as problems by themselves. I remember Laura Ingraham, in one of her books, blaming the A.Q. Kahn smuggling network on Europe, because the Dutch invented the type of centerfuge he sold. —Thinking of Pakistani’s as equals to U.S. citizens, using a technology they understood and worked on, was not something that Ingraham wanted to tell her readers. —In her book, at least, Nuclear proliferation was the fault of the moral weakness of Europeans. In private, she might not believe it, but she read the proof galleries ofher own book. The noxious Laura Ingraham notwithstanding, weaknesses in the Dutch security system had quite a lot to do with AQ Khan’s theft of a fairly advanced centrifuge design and that made a lot of other developments possible, like his network. Can anyone throw light on, why the CIA analyst Richard Barlow was hounded and his life destroyed by the US State Dept. high officials, for blowing whistle on Dr AQ Khan’s nuke theft from the Dutch Lab …. ?